I’ve been on my holidays, and with them a three week hiatus from playing games, save for the odd crack at Reiner Knizia’s Ingenious and Robot Master on iOS. On returning home, I was pleased to be able to blow away the post-holiday blues on Saturday with a sprightly four-player session of Airlines Europe, and a couple of two-player games of Dominion. The former of those proved itself, once again, to provide much of the thrill a more complicated investment game might, without, for better and for worse, much of the associated stress. Wresting control of Jolly Roger Airships, thanks to a lucky mid-game blind draw was buzz, as was being fortunate enough to make an eight million euro investment into the same company the very turn before the second scoring card showed up. Nevertheless, for all the excitement of each event, its respective impact upon the overall outcome of the game was relatively inconsiderable. Jolly Roger became the most valuable airline, and my stake in it provided me with 14 victory points at the end of the game. However, had I been the joint-largest shareholder, rather than largest outright, I would still have received 11 points for my share in it (meaning that extra share in Jolly Roger was barely more valuable than a single share any other airline would have been). Meanwhile, the eight million euro investment earlier in the game brought only two additional victory points in that scoring round. In short, those moments which defined my experience of the game had relatively little impact in determining my eventual final score. The insulation against crushing failure which makes Airlines Europe fly as a family game has the regrettable, if inevitable, flipside of clipping the wings of any successes. 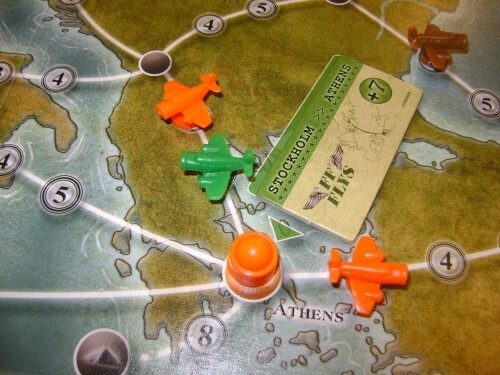 Indeed, it’s fair to say that in this game of Airlines Europe, as in others, the dénouement of final scoring well reflected the tone of the game itself: irresistibly exiting for the narrow margins between victory and defeat, but undercut by the sense that the limited difference between triumph and disaster should mean the two imposters were better treated just the same. The winner of this particular game managed 72 points, I had 71, the third place player 70, and the player in fourth 66. 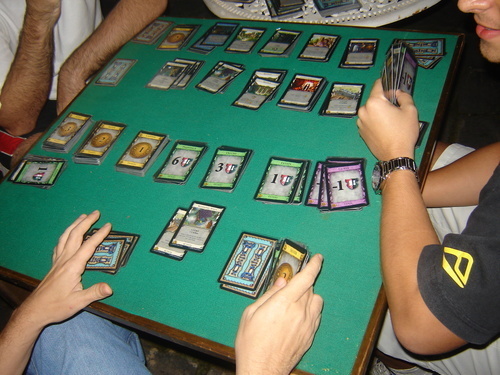 Without meaning to cast doubt upon the skill of any player, it would be hard to say the actual winner represented the only possible rightful victor: the final scoring card (shuffled among the bottom ten share cards in the game’s deck) could have come a turn or two later and in doing so produced an entirely reversed result. The games of Dominion I also played that day provide a note of contrast, in terms of tight scoring and its significance. Each was also pretty close – the former I lost by two points, the latter I won by three. However, unlike in Airlines Europe, victory could broadly be said to have been deserved, and so could defeat. Partly, knowing exactly when a game will end allows for more precisely reasoned action. An additional key factor, I think, is the fact that victory points in Dominion are not only theoretically trackable, but are realistically calculable (in most cases). This is because victory points are spread across a small number different cards, each of which is only available in limited quantities. It’s not so taxing to keep a mental note of how many Provinces you’ve bought (only eight in total are used in a two-player game), or how many Estates you’ve trashed. Therefore it is not too great a challenge to calculate your score, or that of your opponent, at any given point. The result of this is that it’s possible during a game of Dominion to make moves knowing yourself to be in a winning or a losing position – something which is much less possible in Airlines Europe. In the first game of Dominion I played on Saturday, for instance, I knew my opponent had a four point advantage over me with only two Provinces left in the supply. Because of this, I gambled – knowing the gambit I was using would, in itself, feel like a deserving winning move if it worked, but knowing also that my opponent’s better play earlier in the game would make her a fit winner if I failed. (For those interested, I trashed a succession of Mining Villages in one turn – an action which gives extra money – aiming to put myself in the position to buy both remaining Provinces in one go. I fell short by the equivalent of one Copper card.) Key moments can directly be understood in terms of their impact upon winning or losing, unlike in Airlines Europe. I very much enjoy Airlines Europe, and enjoyed Saturday’s game a great deal. However, the suspension of disbelief necessary to feel that the game’s moments of drama really matter is large. A close score is only truly satisfying if victory can be felt to have been deserved (or, by extension, defeat feels warranted). That the exact point at which a game of Airlines Europe will end is unknown, and that victory points are almost impossible to track each hinder this feeling.